(Ipswich) Georgetown won its seventh straight game (including the five that earned them the Division 4 title) as they defeated Ipswich, 5-2, on a pleasant Tuesday afternoon in Ipswich. 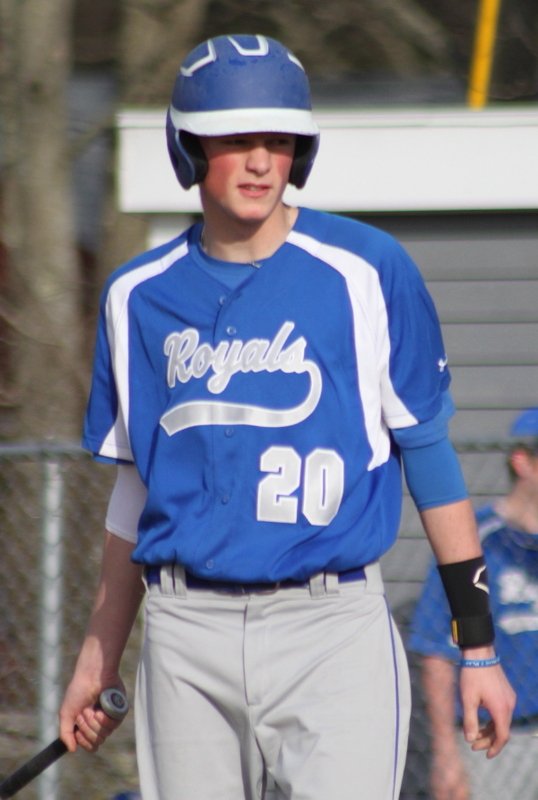 The Royals (2-0) collected two unearned runs in the 4th inning and survived a bases loaded, no-one-out situation in the 6th inning to gain the win in their Cape Ann League opener. Ben Noelk and Tom Pingree each had two RBI for Georgetown. CJ Ingraham had three of the Royals’ nine hits and also drove in a run. 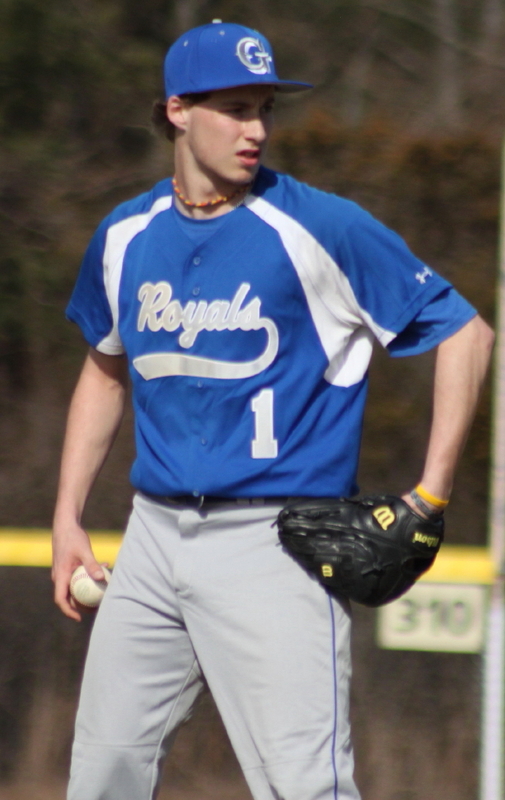 Junior Patrick Slack was the winning pitcher. He scattered three hits and K’d seven Tigers during six innings of work. 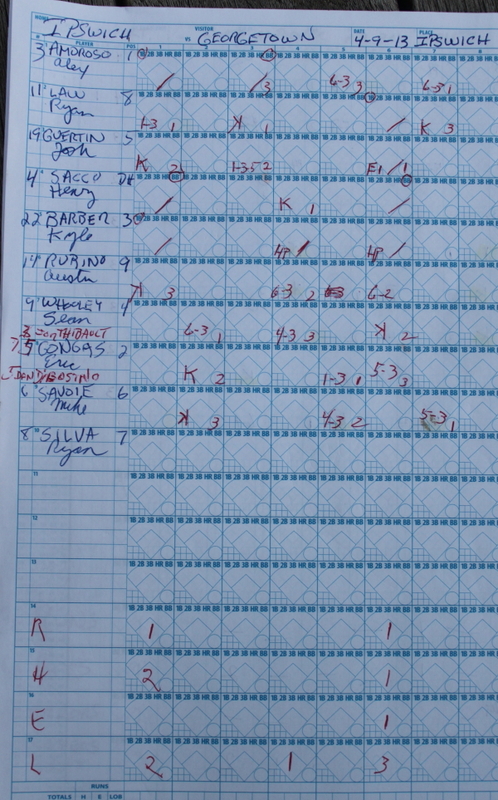 Dave Ingraham pitched the seventh and recorded a 1-2-3 final inning. Patrick Slack (1-0) put himself into some serious trouble in the sixth but managed to escape with minimal damage. Four batters into the sixth inning Patrick had given up a single (Ryan Law), made a bad throw to second on a grounder (Josh Guertin), walked a batter (Henry Sacco), and hit another batter (Kyle Barber). 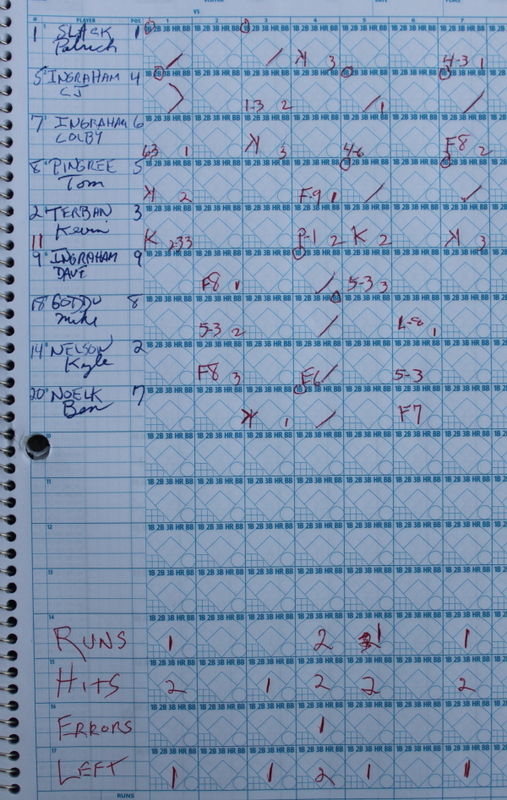 With one run in (score now 4-2) and more a distinct possibility, the drawn in G’town infield forced a run at the plate. Then Patrick K’d pinch-hitter Jordan Thibault and got Eric Gongas to end the threat grounding out to third. The Royals broke open a 1-1 game in the 4th inning with two unearned runs both scored with two outs. A Dave Ingraham single and a walk to Mike Goddu put runners on base. An error by Tiger shortstop Mike Savoie on sophomore Kyle Nelson’s sharp grounder extended the inning with the bases loaded. 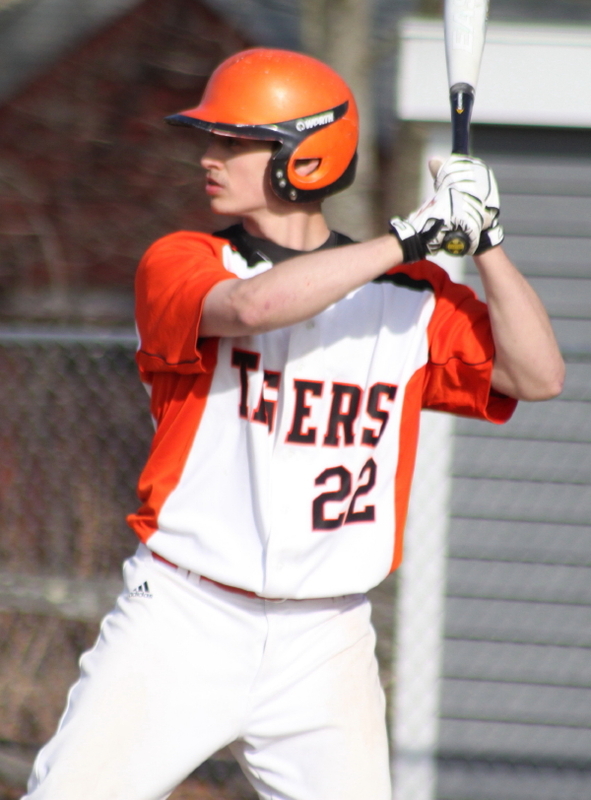 Ben Noelk made Ipswich pay as he sliced a single in front of centerfielder Ryan Law delivering Dave Ingraham and Mike Goddu. 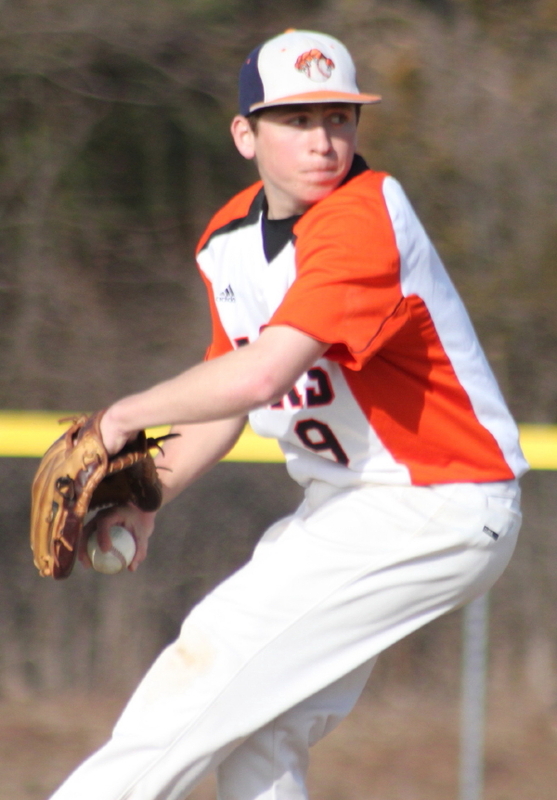 Alex Amoroso went the first four innings for Ipswich (0-1) and Sean Whooley the final three. Georgetown touched Alex for a run in the first. A single and steal by leadoff batter Patrick Slack was followed by a run-scoring double by CJ Ingraham (3 hits). Ipswich answered right back in the bottom of the first. Alex Amoroso reached on an infield hit and took second on a wild pitch. The Tiger senior reached third thanks to Ryan Law’s sacrifice bunt and scored on Kyle Barber’s rip off third baseman Tom Pingree’s glove. The Royals picked up the two unearned runs in the fourth to lead 3-1 before adding another score in the fifth off of Sean Whooley. 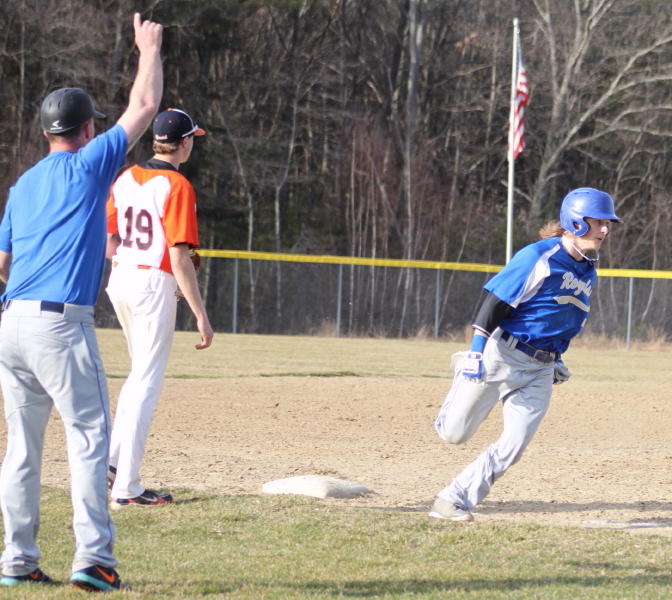 Colby Ingraham reached on a fielder’s choice, stole second, and was sent home by Tom Pingree’s single to right center. Up 4-1, the Royals survived the Tiger threat in the sixth allowing just one run. 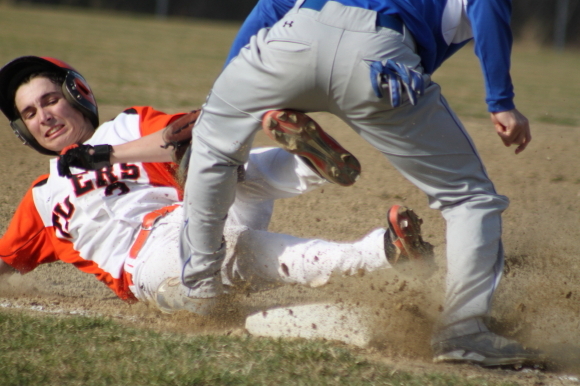 Georgetown pushed across its 5th run in the seventh. CJ Ingraham singled, stole second, and was delivered with two outs by Tom Pingree. The two teams will meet again in two weeks at Georgetown. The Royals next game will be hosting Manchester-Essex on Thursday. 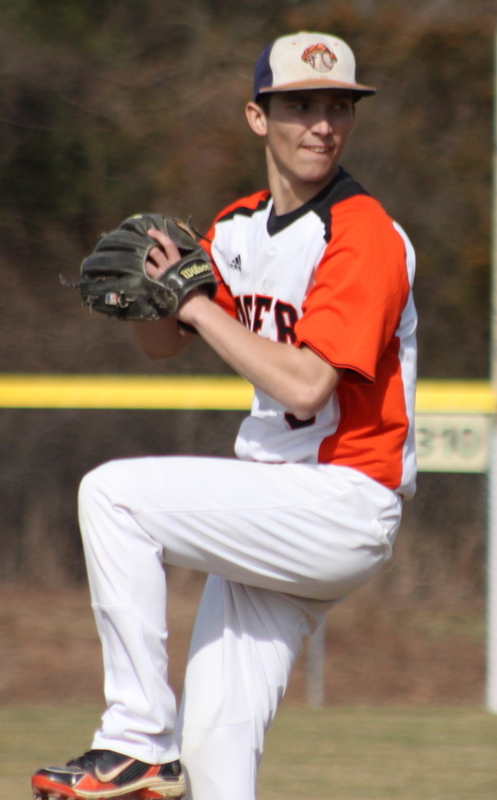 The Tigers will entertain Amesbury next Tuesday at 10AM. Division 3 Ipswich was 6-13 last season but lost eight of those game by one run. GHS coach Justin Spurr has thirteen players back from last season’s championship team. Star Ryan Browner is now at Southern Maine but there is still plenty of talent on the roster. It is not hard to imagine Georgetown still playing games in June. Kyle Barber was hit by pitches twice and drove in both Ipswich runs. 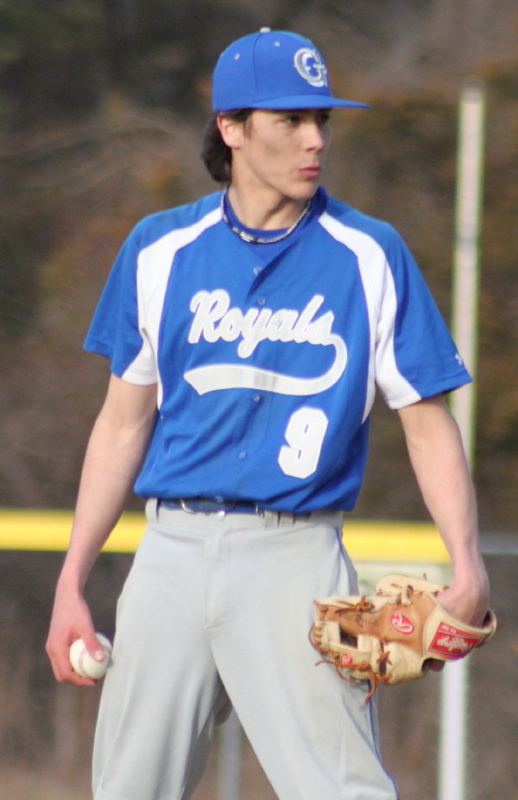 Sophomore catcher Kyle Nelson made his Georgetown varsity debut today. Three times Georgetown put themselves into scoring position with steals that led to runs. 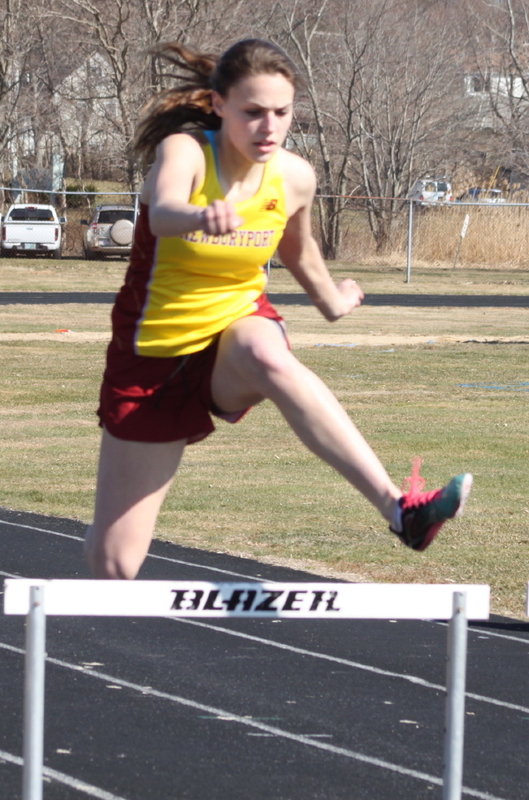 (Newburyport) Plenty of sunshine and plenty of success for Newburyport in outdoor track competition with Lynnfield on Monday afternoon. The Clippers (1-1) recovered nicely from last week’s losses to North Reading in their Cape Ann League opener. The Newburyport boys defeated the Pioneers, 92-51, while the Clipper girls came out ahead, 90 ½ – 54 ½. On a bright day (I’m making excuses for the pictures already!) I took a number of pictures of the participants. 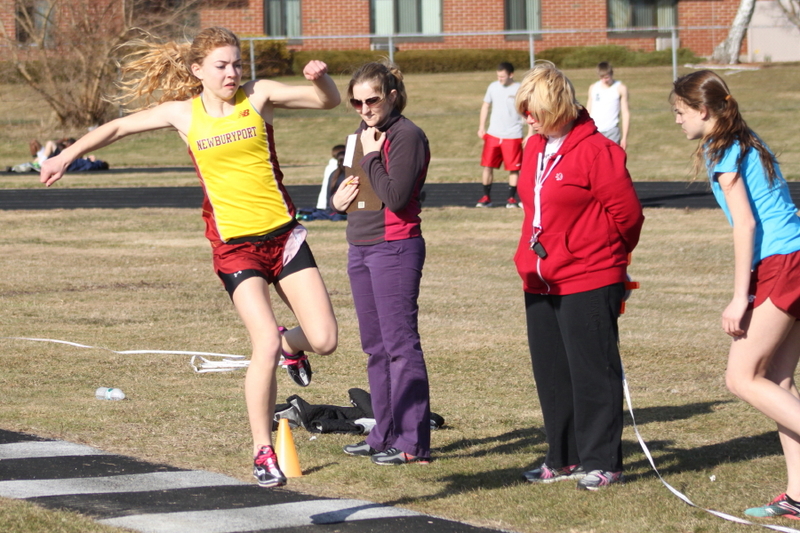 I prepped for the race by taking a look at the 2012 CAL outdoor track championships at North Andover. 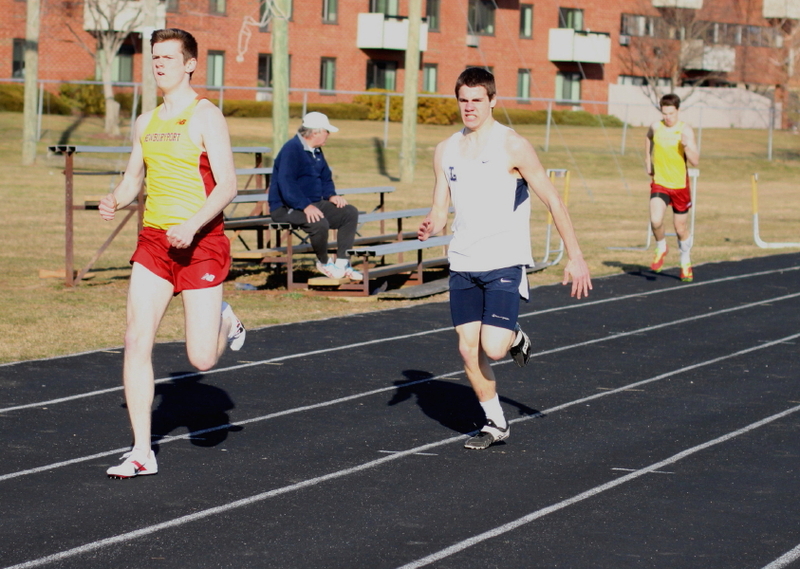 That research alerted me to the best matchup in this meet – Steve Preston (Nbpt) versus DJ DeGeorge (Lynnfield). 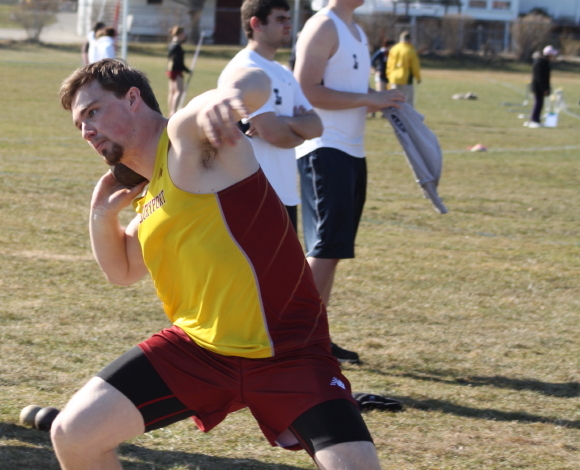 The event was the shot put. In the CAL championships DJ was the winner with a put of 48’11”. Steve was third with 46’4”. On Monday afternoon Steve turned out the winner reaching 49’. I don’t know DJ’s distance this time around but he ended up second. 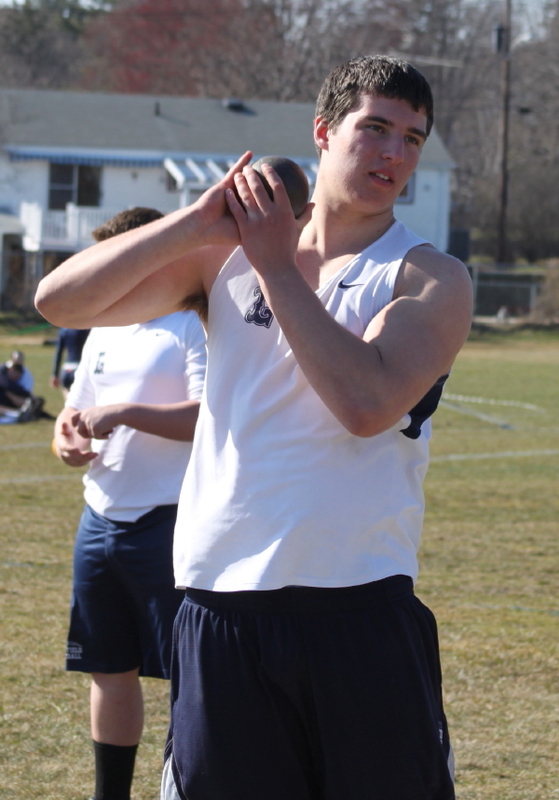 Steve also won the discus with a throw of 142’ 5”. That length would have won last year’s CAL meet in which Steve ended up second throwing 138’ 1”. DJ was second today in the discus. Steve also had a second in the 100 behind teammate junior Tom Graham. 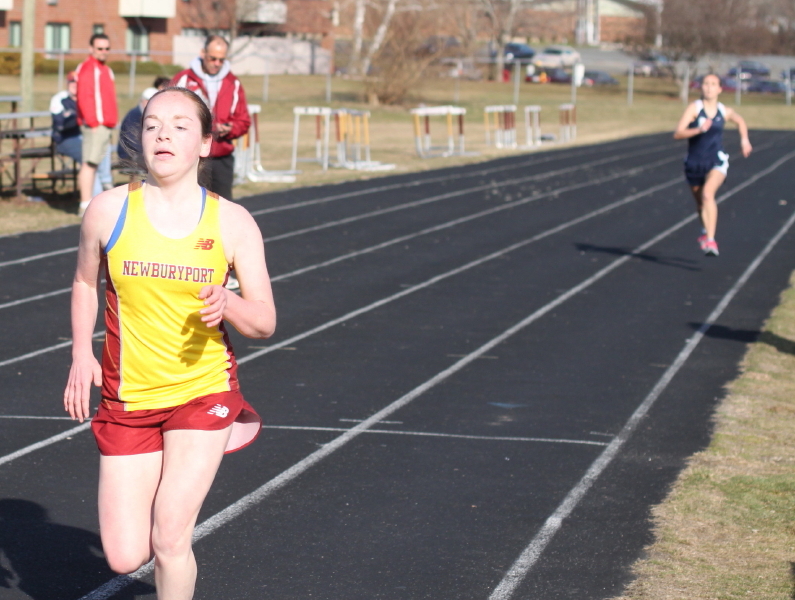 Watching the Newburyport distance runners is always entertaining. You go into having no idea what the “script” will be. 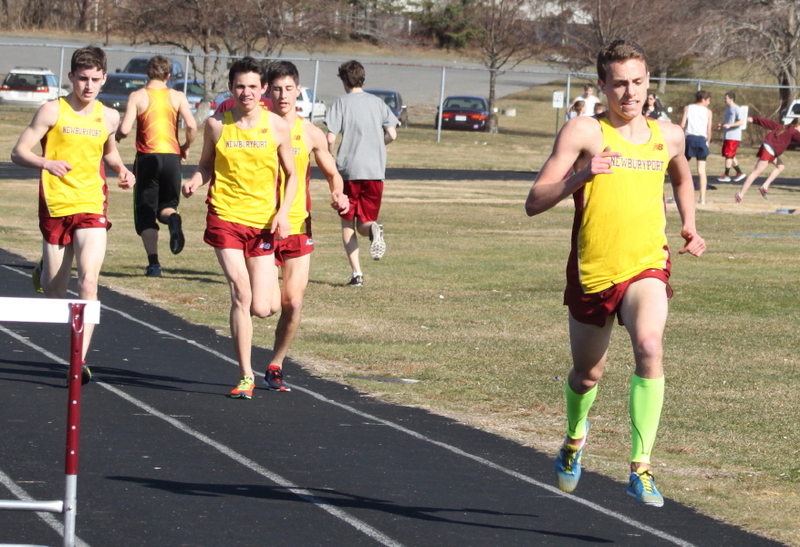 In the two-mile, the “script” was determined by how long Lynnfield’s Chase Davidson could stay in contention. When he dropped back the front four orchestrated the way the race would go, in conversion as the race went along. In the final stretch, Max Vye “pulled away) from Joe Santo, Nick Carleo, and Chris Orlando to get the win. 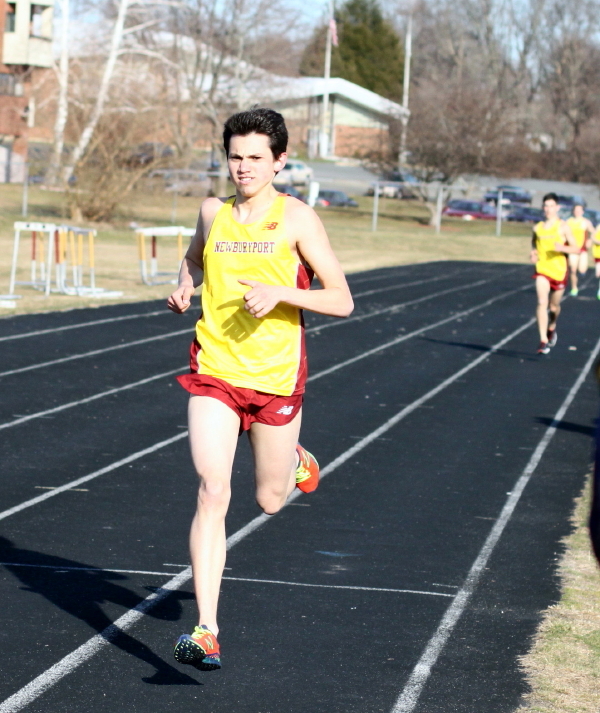 The one mile event was run without scripting and Nick Carleo won decisively. His time was 4:47 which is quite a ways from his 4:29.8 at the CAL championships last May. 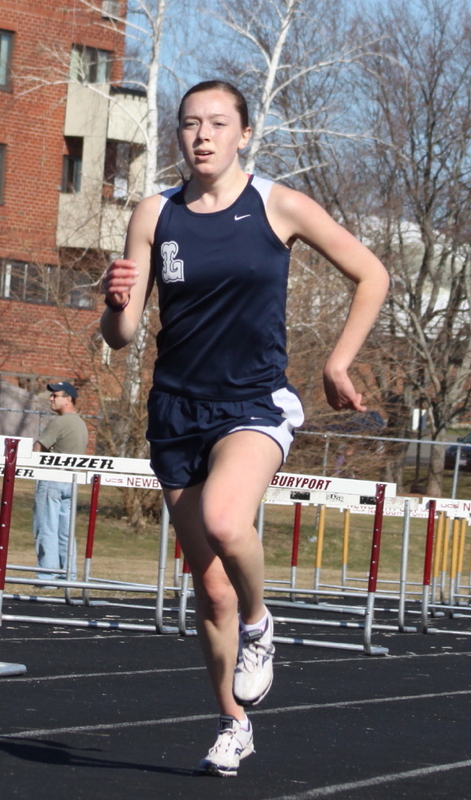 Lexi Buonfiglio was a decisive winner for Lynnfield in the 800. The senior was 4th in the CAL championships and all of the girls who finished ahead of her have graduated. Next for Newburyport will be hosting undefeated Masco (2-0) on Thursday. For Lynnfield, it will be a trip to Ipswich (1-0) on the same day.